Kanjirappally is a taluk and a town in Kottayam district, in the state of Kerala, India. Rubber plantations are a major source of income for the local population. The place has a large population of Syrian Catholic christians. 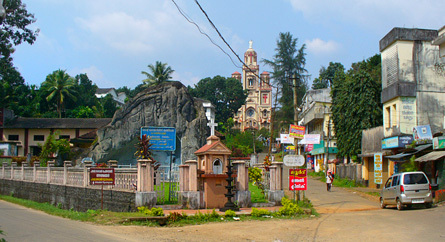 The Christian colonization of Kanjirappally had a profound impact on the history of commerce and agriculture in these parts. The Christians claim their roots from early settlements at Nilakkal or Chayal on the banks of river Pamba. There is also a strong belief that the flourishing Christian community her was founded by St. Thomas the Apostle himself. The place was in the forest recesses far away from seats of power. Nilakkal became an important depot for spices like pepper, cardamom etc. and the Christians were engaged in this lucrative trade as procures and sorters. The oldest church of the Christians in Kanjirappally, namely, "Pazhayapally" (meaning Old Church) in the name of St. Mary, was built in 1449, fifty years before Vasco de Gama set foot in India.